Grigor Dimitrov, Juan Martin del Potro, Fabio Fognini and Fernando Verdasco advance to the semi-finals of the Intrum Stockholm Open. Top seed Grigor Dimitrov headlined Friday’s quarterfinal action at the Intrum Strockholm Open with a 6-3, 6-4 win over fifth favourite Mischa Zverev from Germany. The 26-year-old Bulgarian, who is still No. 6 in the Emirates ATP Race To London, didn’t face a break point, converting two of his own to close out the victory with his sixth match point after one hour and 13 minutes. He will next take on sixth seed Fabio Fognini of Italy, who saved two match points to outlast the tournament’s number three Jack Sock from the United States 6-7, 7-6, 7-5 in two hours and 51 minutes. Defending champion Juan Martin Del Potro from Argentina beat Yuichi Sugita of Japan 6-2, 7-6 to face Fernando Verdasco in the semi-final. The Spanish veteran knocked off second seed Kevin Anderson 7-6, 7-6 in the final match of the day. 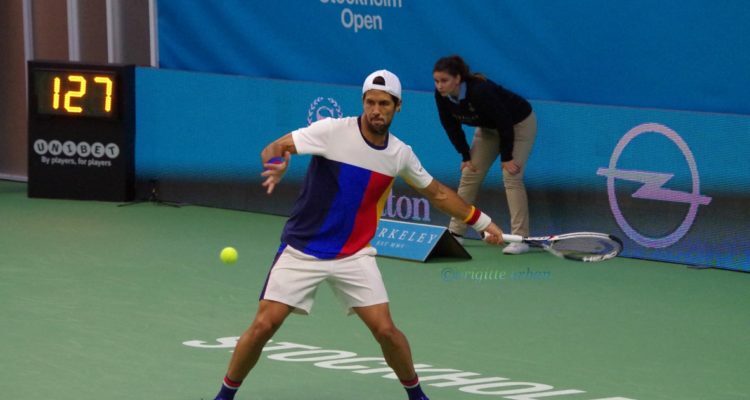 Verdasco withstood 10 aces, hitting two of his own to advance in one hour and 42 minutes. This entry was posted in ATP 250 Stockholm, ATP Tour and tagged ATP World Tour, Fernando Verdasco, Juan Martin Del Potro, Stockholm.